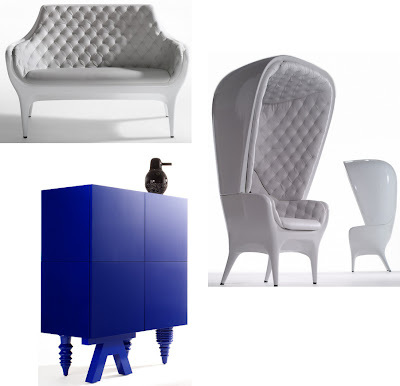 These very elegant and sophisticated pieces are by Spanish artist and designer Jaime Hayon. They're made of plastic, and in the case of the chairs, leather as well. I also think they have a slightly camp, humourous feel about them which I love. That might just be my slightly strange opinion - but this range is influenced by the big Classic MGM musicals. It's called the Showtime Collection and was designed for BD Barcelona. Wow those are some chairs. Very whimsical. They sort of remind me of something out of Alice in Wonderland!